The lighter way to get fat. I've just eaten an entire box of these and now feel sick (and pretty disgusted with myself). THEY DO THESE FOR A POUND IN POUND SHOP. The boxes in Poundland are 120g if I'm not mistaken. This is a far better deal. 2 Poundland boxes are 240g . 120g X 2. 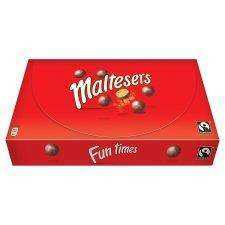 This is the best deal you will find for Maltesers, snap it up! poundland - rubbish shop with smaller specially made item to sell at a pound, makes you never heard of - junk - would not go near them - give me John Lewis and Waitrose everytime. Thats whats wrong with the country everthing now is to the lowest denimator.